When it comes to oysters, people either love them or hate them. My own household is divided. If you’re a lover, you’re in luck. Pacific oysters provide omega-3 fats, which have been shown to reduce inflammation in people who suffer with swollen joints. In a small skillet, heat the oil over medium heat. Add the flour and cook 3-4 minutes, stirring continuously until a thick, smooth paste forms. Remove from the heat and add the water, lemon zest and juice, spinach, basil, garlic, and hot sauce. Whisk quickly until a thick sauce forms. Season with salt and pepper to taste. 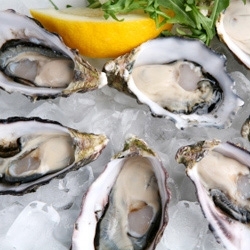 Preheat a grill or an oven to 400° F. Shuck the oysters, reserving the shells. Arrange the oysters in the deepest reserved half-shells, one oyster per shell. Top with a spoonful of the spinach mixture and sprinkle with the Parmesan. If grilling, set the half-shells on the grill, filling-side up. Cover loosely with a sheet of aluminum foil, and grill 8-10 minutes, until oysters are no longer translucent but still tender. If baking, place the half-shells on a baking sheet covered with aluminum foil, and bake 8-10 minutes, until the oysters are cooked inside and the filling begins to brown and the oysters are no longer translucent but still tender. Serve immediately.